Mehrdad Samimi began his art training as a young boy under his father, the celebrated oil painter and royal portraitist Reza Samimi. While attending the University of Arizona in pursuit of his architectural degree, he was featured in a documentary film about the university as an outstanding talented foreign student. Although a successful architect since 1964, he has continued to paint, becoming widely recognized for his remarkable work in the classical pre-impressionist style. 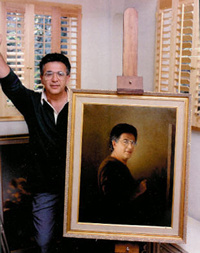 His unique recreation of a famous 19th century painting lost in a fire, using computer technology and personal talent gained him national recognition in 1993. For this accomplishment, he was featured extensively in the media including NBC-TV and Associated Press. Such national recognition helped him secure portrait commissions of several dignitaries and public figures including the Governor of California and the mayor of New Orleans. His works have been exhibited in galleries in New York, San Francisco, Los Angeles, Vancouver and London. As an accomplished portrait artist, he is listed with Smithsonian National Portrait Gallery in Washington, D.C. His clientele includes collectors stretching from Tokyo and Sydney, Australia to Monaco, Abu Dhabi and Tehran. A resident of the San Francisco Bay Area since 1959, Mehrdad has always been proud of his Iranian heritage. Being a versatile artist, a licensed Architect, a truly capable craftsman and Builder as well as an accomplished classical guitarist qualifies him as a true "renaissance man".